Before 1900, women spent many of their daylight hours sewing clothes for themselves and their families by hand. Women also formed the majority of the labor force that sewed clothes in factories and wove fabrics in mills. The invention and proliferation of the sewing machine freed women of this chore, liberated workers from poorly paid long hours in factories, and produced a wide variety of less expensive clothing. The industrial sewing machine made a range of products possible and affordable. The home and portable sewing machines also introduced amateur seamstresses to the delights of sewing as a craft. The pioneers in the development of the sewing machine were hard at work at the end of the eighteenth century in England, France, and the United States. The English cabinetmaker Thomas Saint garnered the first patent for a sewing machine in 1790. Leather and canvas could be stitched by this heavy machine, which used a notched needle and awl to create a chain stitch. Like many early machines, it copied the motions of hand sewing. In 1807, a critical innovation was patented by William and Edward Chapman in England. Their sewing machine used a needle with an eye in the point of the needle instead of at the top. In France, Bartheleémy Thimmonier's machine patented in 1830 literally caused a riot. A French tailor, Thimmonier developed a machine that stitched fabric together by chain stitching with a curved needle. His factory produced uniforms for the French Army and had 80 machines at work by 1841. A mob of tailors displaced by the factory rioted, destroyed the machines, and nearly killed Thimmonier. Across the Atlantic, Walter Hunt made a machine with an eye-pointed needle that created a locked stitch with a second thread from underneath. Hunt's machine, devised in 1834, was never patented. Elias Howe, credited as the inventor of the sewing machine, designed and patented his creation in 1846. Howe was employed at a machine shop in Boston and was trying to support his family. A friend helped him financially while he perfected his invention, which also produced a lock stitch by using an eye-pointed needle and a bobbin that carried the second thread. Howe tried to market his machine in England, but, while he was overseas, others copied his invention. When he returned in 1849, he was again backed financially while he sued the other companies for patent infringement. By 1854, he had won the suits, thus also establishing the sewing machine as a landmark device in the evolution of patent law. Chief among Howe's competitors was Isaac M. Singer, an inventor, actor, and mechanic who modified a poor design developed by others and obtained his own patent in 1851. His design featured an overhanging arm that positioned the needle over a flat table so the cloth could be worked under the bar in any direction. So many patents for assorted features of sewing machines had been issued by the early 1850s that a "patent pool" was established by four manufacturers so the rights of the pooled patents could be purchased. Howe benefited from this by earning royalties on his patents; Singer, in partnership with Edward Clark, merged the best of the pooled inventions and became the largest producer of sewing machines in the world by 1860. Massive orders for Civil War uniforms created a huge demand for the machines in the 1860s, and the patent pool made Howe and Singer the first millionaire inventors in the world. Improvements to the sewing machine continued into the 1850s. Allen B. Wilson, an American cabinetmaker, devised two significant features, the rotary hook shuttle and four-motion (up, down, back, and forward) feed of fabric through the machine. Singer modified his invention until his death in 1875 and obtained many other patents for improvements and new features. As Howe revolutionized the patent world, Singer made great strides in merchandising. Through installment purchase plans, credit, a repair service, and a trade-in policy, Singer introduced the sewing machine to many homes and established sales techniques that were adopted by salesmen from other industries. The sewing machine changed the face of industry by creating the new field of ready-to-wear clothing. Improvements to the carpeting industry, bookbinding, the boot and shoe trade, hosiery manufacture, and upholstery and furniture making multiplied with the application of the industrial sewing machine. Industrial machines used the swing-needle or zigzag stitch before 1900, although it took many years for this stitch to be adapted to the home machine. 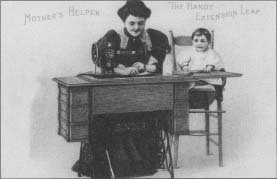 Electric sewing machines were first introduced by Singer in 1889. Modern electronic devices use computer technology to create buttonholes, embroidery, overcast seams, blind stitching, and an array of decorative stitches. Industrial sewing machines require cast iron for their frames and a variety of metals for their fittings. Steel, brass, and a number of alloys are needed to make specialized parts that are durable enough for long hours of use in factory conditions. Some manufacturers cast, machine, and tool their own metal parts; but vendors also supply these parts as well as pneumatic, electric, and electronic elements. Unlike the industrial machine, the home sewing machine is prized for its versatility, flexibility, and portability. Lightweight housings are important, and most home machines have casings made of plastics and polymers that are light, easy to mold, easy to clean, and resistant to chipping and cracking. The frame of the home machine is made of injection-molded aluminum, again for weight considerations. Other metals, such as copper, chrome, and nickel are used to plate specific parts. The home machine also requires an electric motor, a variety of precision-machined metal parts including feed gears, cam mechanisms, hooks, needles, and the needle bar, presser feet, and the main drive shaft. Bobbins can be made of metal or plastic but must be precisely shaped to feed the second thread properly. Circuit boards are also required specific to the main controls of the machine, the pattern and stitch selections, and a range of other features. Motors, machined metal parts, and circuit boards can be supplied by vendors or made by the manufacturers. After the automobile, the sewing machine is the most precisely made machine in the world. Industrial sewing machines are larger and heavier than home machines and are designed to perform only one function. Manufacturers of clothing, for example, use a series of machines with distinct functions that, in succession, create a finished garment. Industrial machines also tend to apply chain or zigzag stitch rather than lock stitch, but machines may be fitted for up to nine threads for strength. Makers of industrial machines may supply a single-function machine to several hundred garment plants all over the world. Consequently, field-testing in the customer's factory is an important element in design. To develop a new machine or make changes in a current model, customers are surveyed, the competition is evaluated, and the nature of the desired improvements (such as faster or quieter machines) are identified. Designs are drawn, and a prototype is made and tested in the customer's plant. If the prototype is satisfactory, the manufacturing engineering section takes over the design to coordinate tolerance of parts, identify parts to be manufactured in-house and the raw materials needed, locate parts to be provided by vendors, and purchase those components. Tools for manufacture, holding fixtures for the assembly line, safety devices for both the machine and the assembly line, and other elements of the manufacturing process must also be designed along with the machine itself. When the design is complete and all parts are available, a first production run is scheduled. The first manufactured lot is carefully checked. Often, changes are identified, the design is returned to development, and the process is repeated until the product is satisfactory. A pilot lot of 10 or 20 machines is then released to a customer to use in production for three to six months. Such field tests prove the device under real conditions, after which larger scale manufacture can begin. Design of the home machine begins in the home. Consumer focus groups learn from sewers the types of new features that are most desired. The research and development (R&D) department of a manufacturer works, in conjunction with the marketing department, to develop specifications for a new machine that is then designed as a prototype. Software for manufacturing the machine is developed, and working models are made and tested by users. Meanwhile, R&D engineers test the working models for durability and establish useful life criteria. In the sewing laboratory, stitch quality is precisely evaluated, and other performance tests are conducted under controlled conditions. A 1899 trade card for Singer sewing machines. Isaac Merritt Singer did not invent the sewing machine. He was not even a master mechanic, but an actor by trade. So, what was Singer's contribution that caused his name to become synonymous with sewing machines? Singer's genius was in his vigorous marketing campaign, directed from the beginning at women and intended to combat the attitude that women did not and could not use machines. When Singer introduced his first home sewing machines in 1856, he confronted resistance from American families for both financial and psychological reasons. It was actually Singer's business partner, Edward Clark, who devised the innovative "hire/purchase plan" to alleviate initial reluctance on financial grounds. This plan allowed families who could not afford the $125 investment for a new sewing machine (the average family income only equaled about $500) to purchase the machine by paying in three- to five-dollar monthly installments. Psychological impediments proved more difficult to overcome. Labor-saving devices in the home were a new concept in the 1850s. Why would women need these machines? What would they do with the time saved? Wasn't work done by hand of better quality? Weren't machines too taxing on women's minds and bodies, and weren't they just too closely associated with man's work and man's world outside the home? Singer tirelessly devised strategies to combat these attitudes, including advertising directly to women. He set up lavish showrooms that simulated elegant domestic parlors; he employed women to demonstrate and teach machine operations; and he used advertising to describe how women's increased free time could be seen as a positive virtue. When the new machine is approved for production, product engineers develop manufacturing methods for the production of machine parts. They also identify the raw materials needed and the parts that are to be ordered from outside sources. Parts made in the factory are put into production as soon as the materials and plans are available. Unlike the industrial machine, the home sewing machine is prized for its versatility, flexibility, and portability. Lightweight housings are important, and most home machines have casings made of plastics and polymers that are light, easy to mold, easy to clean, and resistant to chipping and cracking. 1 The basic part of the industrial machine is called the "bit" or frame and is the housing that characterizes the machine. The bit is made of cast iron on a computer numerical control (CNC) machine that creates the casting with the appropriate holes for inserting components. Manufacture of the bit requires steel castings, forging using bar steel, heat-treating, grinding, and polishing to finish the frame to the specifications needed to house the components. 2 Motors are usually not supplied by the manufacturer but are added by a supplier. International differences in voltage and other mechanical and electrical standards make this approach more practical. 3 Pneumatic or electronic components may be produced by the manufacturer or supplied by vendors. For industrial machines, these are typically made of metal rather than plastic parts. Electronic components are not necessary in most industrial machines because of their single, specialized functions. Parts production in the factory may include a number of precisely made components of the sewing machine. 4 Gears are made of injection-molded synthetics or may be specially tooled to suit the machine. 5 Drive shafts made of metal are hardened, ground, and tested for accuracy; some parts are plated with metals and alloys for specific uses or to provide suitable surfaces. 6 The presser feet are made for particular sewing applications and can be interchangeable on the machine. Appropriate grooves, bevels, and holes are machined into the feet for their application. The finished presser foot is hand polished and plated with nickel. 7 The frame for the home sewing machine / is made of injection-molded aluminum. High-speed cutting tools equipped with ceramic, carbide, or diamond-edged blades are used to drill holes and to mill cuts and recesses to house features of the machine. 8 Covers for the machines are manufactured from high-impact synthetics. They are also precision-molded to fit around and protect the machine's components. Small, single parts are preassembled into modules, whenever possible. 9 The electronic circuit boards that control the machine's many operations are produced by high-speed robotics; they are then subjected to a burn-in period that is several hours long and are tested individually before being assembled in the machines. 10 All of the parts that are preassembled I; join a main assembly line. Robots move the frames from operation to operation, and teams of assemblers fit the modules and components into the machine until it is complete. The assembly teams take pride in their product and are responsible for purchasing the components, assembling them, and making quality control checks until the machines are completed. As a final quality check, every machine is tested for safety and various sewing procedures. 11 The home sewing machines are sent to packing where they are separately assembled by power control units that are foot-operated. A variety of accessories and instruction manuals are packed with the individual machines. The packaged products are shipped to local distribution centers. The quality control department inspects all raw materials and all components furnished by suppliers when they arrive at the factory. These items are matched with plans and specifications. The parts are again checked along every step of manufacture by the makers, receivers, or persons who add the components along the assembly line. Independent quality control inspectors examine the product at various stages of assembly and when it is finished. No byproducts result from sewing machine manufacture, although a number of specialized machines or models may be produced at one plant. Waste is also minimized. Steel, brass, and other metals are salvaged and melted down for precision castings whenever possible. Remaining metal waste is sold to a salvage dealer. The merging of the capabilities of the electronic sewing machine and the software industry is creating an ever-widening range of creative features for this versatile machine. Efforts have been made to develop threadless machines that inject thermal fluids that harden with heat to finish seams, but these may fall outside the definition of "sewing." Large embroideries can be machine-produced based on designs developed onscreen using AUTOCAD or other design software. The software allows the designer to shrink, enlarge, rotate, mirror designs, and select colors and types of stitches that can then be embroidered on materials ranging from satin to leather to make products like baseball caps and jackets. The speed of the process lets products celebrating today's victories hit the street by tomorrow's business day. 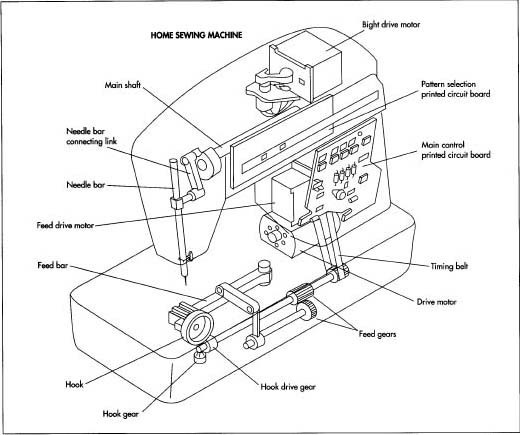 Because such features are add-ons, the home sewer can buy a basic home sewing machine and enhance it over the years with only those features most frequently used or of interest. Sewing machines become individual crafting devices and, therefore, seem to have a future as promising as the imagination of the operator. Finniston, Monty, ed. Oxford Illustrated Encyclopedia of Invention and Technology. Oxford University Press, 1992. Allen, 0. "The power of patents." American Heritage, September/October 1990, p. 46. Foote, Timothy. "1846." Smithsonian, April. 1996, p. 38. Very good artcle,I want to know more and then learn more about current machines use in sewing/making clothes this day.